False alarms are generated when thermal noise exceeds a pre-set threshold level, by the presence of spurious signals (either internal to the radar receiver or from sources external to the radar), or by equipment malfunction. A false alarm may be manifested as a momentary blip on a cathode ray tube (CRT) display, a digital signal processor output, an audio signal, or by all of these means. If the detection threshold is set too high, there will be very few false alarms, but the signal-to-noise ratio required will inhibit detection of valid targets. If the threshold is set too low, the large number of false alarms will mask detection of valid targets. But one false alarm arises! threshold is set too low: a large number of false alarms arises! The false alarm rate depends on the level of all interferences, like noise, clutter or jamming. Near the radar site the influence of the fixed clutter is higher than the noise level. At large distances the influence of the noise level is higher. This has the effect, that the false alarm rate depends on the range. 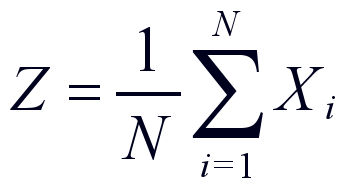 But the equation doesn't give any range dependences. To achieve a higher probability of detection in large distances by using a lower threshold level, the false alarm rate rises at close range. Figure 2: Principle of a “Cell-averaging CFAR”- wiring. The principle of a circuit for a constant false alarm rate was first described in 1968 by H. M. Finn and R. S. Johnson. Solutions to the false-alarm problem involve implementation of constant false-alarm rate (CFAR) schemes that vary the detection threshold as a function of the sensed environment. 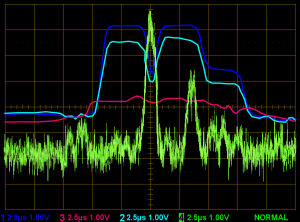 Whilst there are a large number of types of CFAR circuit, they are usually based around the ‘background averager’ (sometimes referred to as cell averaging CFAR). 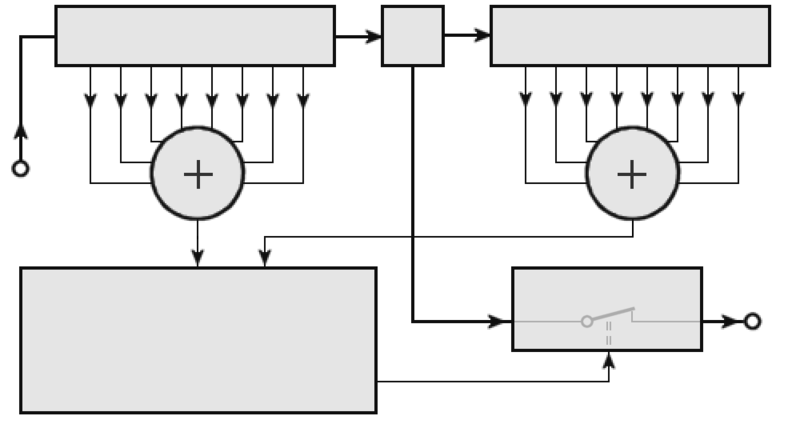 A simplified block diagram is shown in Figure 2. 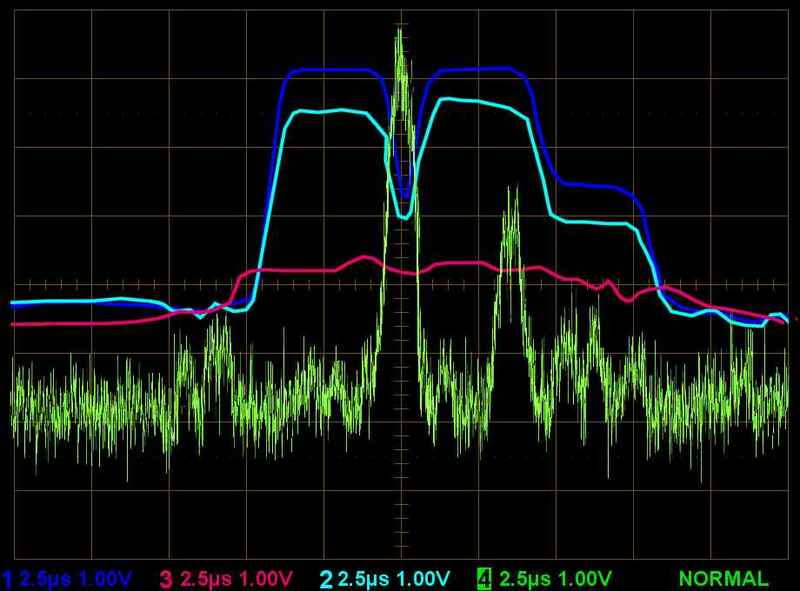 The basis of the circuit is that when noise is present, the cells around the cell of interest will contain a good estimate of the noise in the tested cell, i.e. it assumes that the noise or interference is spatially or temporarily homogeneous. 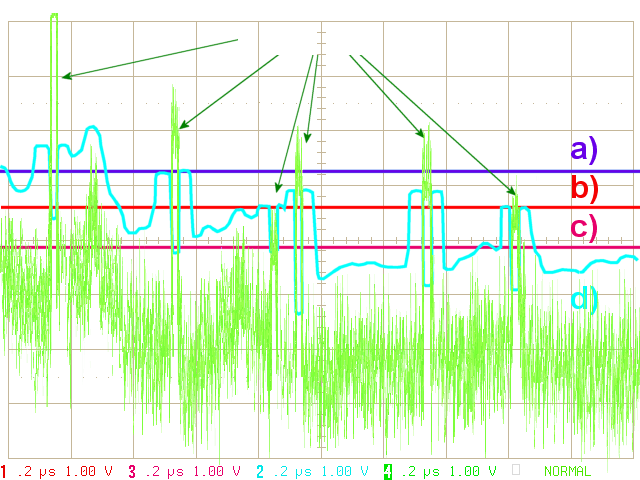 Theoretically the circuit will produce a constant false alarm rate, which is independent of the noise or clutter level so long as the noise has a Rayleigh distribution in all range cells investigated by the circuitry. In Figure 1 the graph d) denotes a customized profile of the threshold to the level of the noise floor. The interference at the beginning of the deflection, which would cause for the threshold a) a false alarm, also reaches a critical level here. However, the third echo signal, which is so weak that it would be lost even under the optimal threshold b), will be detected in the CFAR. Figure 3: Comparing the thresholds of various CFAR method for the situation of two adjacent targets: the weaker target is hidden by the stronger one at the cell-averaging methods. In the CA-CFAR method this averaging is carried out in the device "arithmetic logic unit" too. The CA-CFAR graph in Figure 3 shows strong values left and right of the target, but at the target itself it has got a relatively low value. This can be quite easily explained by the schematic diagram. Shortly before and shortly after the range cell under test (RUT, sometimes called cell under test, CUT), the strong amplitude of the echo signal has an impact on the average. Therefore this one raises to its maximum. During the target itself, the average is made without the amplitude of the target. The threshold will be relatively low. The CFAR thus makes for strong targets a contrast enhancement. In a noise environment, very weak echo signals may be lost rather than in the case of a fixed threshold. One way to reduce these losses is, the both close to the RUT located cells not to include in the evaluation (in the circuit in Figure 2 indicated as dashed lines). These unused cells are then called guard cells. The remaining cells are called reference window cells. Advantages of CAGO CFAR are the small required computing power and relatively low target losses. Compared to the CA-CFAR the treatment of non-homogeneous clutter environment is improved. Disadvantages are: the overall still low effectiveness and the possibility (typical for all CA-CFAR variants) that two adjacent targets can cover each other (see Figure 3). There are also problems during an abrupt change in the disturbance signals (for example, on the edges of fixed clutter areas). The Cell-Averaging Smallest Of-CFAR (CASO-CFAR) uses the same circuit as the CAGO-CFAR. The one and only difference is that instead of the higher value of the output signal of both delay lines now the smaller one is used. 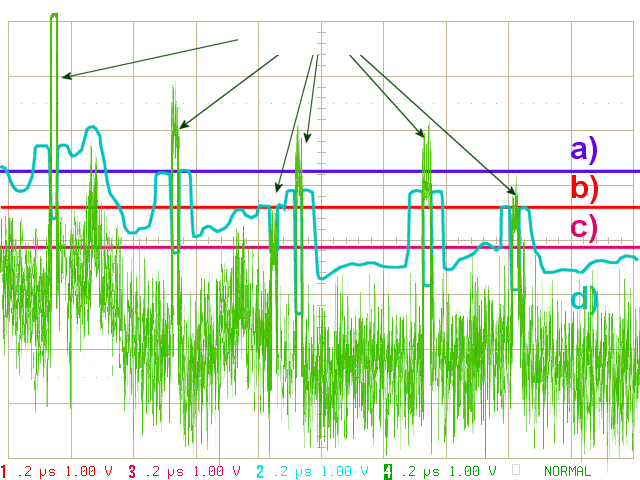 The big level of the adjacent echo signal is thus usually not used for the threshold value calculation. The possibility that two adjacent target sign can cover each other, is therefore slightly reduced. Since the previous methods can not treat equally both extremes of the interference environment (homogeneous and non-homogeneous interference environment), the method of Ordered Statistic-CFAR (OS-CFAR) have been developed. 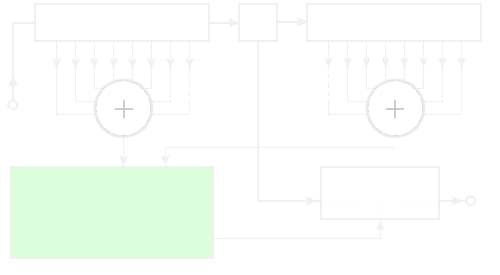 In the block diagram in Figure 2, the two logic symbols with the plus sign are replaced by a statistical method. The amplitude values taken from the reference windows are first rank-ordered according to decreasing magnitude. A certain number of the highest values will be excluded from further processing. It can be formed an average of the remaining values again (CAOS-CFAR), and/or additional weights are made, for example, depending on the average noise level (OS-CFAR). Here can be done also a separate division in preceding and subsequent reference window cells. Their individual results can be selected again as Greatest Of (OSGO-CFAR) or Smallest Of (OSSO-CFAR) before further processing. Advantage of the OS-CFAR is the much better effectiveness of the preparation of the threshold. Adjacent echo signals can no longer cover each other. The major disadvantage of the OS-CFAR is the high processing power required for performing the sorting algorithm. This processing power must be provided during the real-time part of radar signal processing, since the threshold calculation is still ahead of target recognition. The so-called CASH CFAR (Cell Averaging Statistic Hofele) is also a statistical method which was developed by Franz Xaver Hofele, an employee of the former DASA (today Cassidian electronics). It is based on a series of summating elements associated with each range cell and a specific maximum-minimum detector. The advantage of the CASH-CFAR algorithm is that it avoids alternate covering and aggregation of objects. Their time side lobes resulting from the pulse compression are thereby reliably hidden by the threshold. The required processing power of the CASH-CFAR algorithm is also significantly less than that of the OS- and CAOS-CFAR algorithms with their rank-selection methods. The MAMIS-CFAR (MAximum MInimum Statistic) is essentially the same as the CASH-CFAR, except that a special maximum-minimum circuit replaces the adders of the CASH-CFAR (for example, as an FPGA chip). The characteristics of the MAMIS-CFAR are quite similar to those of the CASH-CFAR for the handling of block interference and of point- and extended targets. In the case of a simple keyed on/off modulated pulse radar, the duration of a false alarm Λ is equal to the length of the pulse. In the case of a radar with intrapulse modulation, the duration of a false alarm can only be measured after the pulse compression. For this reason, there are also calculations into which the bandwidth Btx of the transmitters pulse is used as a measure for the pulse compression rate as well as for the possible range resolution.